There is no question email and social networking websites have altered the way we live. The question is, In what way has growing electronic communication improved the exchange of information beyond the social architecture of education, medicine, scientific research, and governments? Marina Gorbis, in her exceptionally well researched, The Nature of the Future—Dispatches from the Socialstructed World, attempts to answer this question. She joins a growing number of futurists, Jack Uldrich, Richard Slaughter, Ross Dawson, and Rebecca Costa. Costa, author of The Watchman’s Rattle: Thinking Our Way Out of Extinction, whom Ms. Gorbis quotes in her book, explores ways to bridge the communications gap as a way to foster superior analysis and “save” our society. 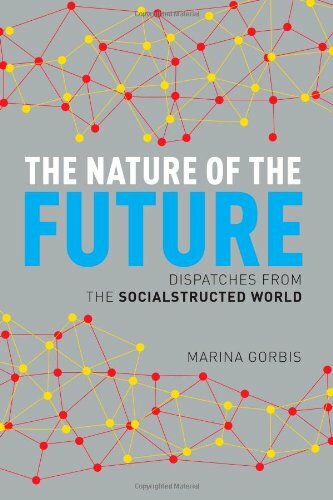 Like the other futurists, Ms. Gorbis doesn’t predict the future as much as she explains what is happening now and how it shapes our future and connects us to the larger world. Ms. Gorbis holds a masters degree from the Graduate School of Public Policy at U.C. Berkeley. She invents a word, socialstructing, which she uses to explain the way we connect the chasms that formerly made it difficult to share in all ways the new electronic frontier has made possible. Ms. Gorbis’s book is lopsided, conflicted, and contradictory in her endeavor to educate the masses. She moves back and forth throughout the book from her lack of respect for public education and the fantastic future of science and technology. She begins the book by slamming primary public education. Ms. Gorbis maintains that the public education most people receive in this country is the basis for stifling all creative intellect. Yet Ms. Gorbis herself is a product of a public education. Ms. Gorbis’s solution to the inadequacies is only one, which is the private school, The Peninsula School in Menlo Park, California. The Peninsula School is very prestigious and expensive; a school few can afford. Tuition for the Peninsula School for three and four year olds and kindergarten begins at $12,000 a school year for a half day. Full-day kindergarten and upper grades costs $16,000 per annum. There is no doubt The Peninsula School offers some excellent learning opportunities. Such a creative environment allowing a child’s curiosity encouraged in an open and free surrounding is excellent for all the obvious reasons. It would be magnificent if all children could receive such an educational experience. Yet to compare this very exclusive and expensive school to the entire educational system of the United States is hardly accurate. Obviously, Bill Gates and Marina Gorbis forget that most of the information provided in Google comes from those educated in the traditional institutions she rejects. Fortunately, in the second half of the book Ms. Gorbis hits her stride and finds a good, clear voice that finally reflects her impressive credentials as a thought leader and futurist. The chapters on science are exciting and encouraging. Her research into the strides technology has spawned is remarkable. A simple and obvious example is the ability to monitor disease from a global perspective such as the Centers for Disease Control. Ms. Gorbis becomes clear when she is in her element of seeing science funded by people from all over the world and sharing information in what is known as “crowd sourcing.” In this example, crowdsourcing allows all interested people to participate in a multitude of scientific projects. When Ms. Gorbis focuses on her basic premise in The Nature of the Future—Dispatches from the Socialstructed World, she breaks through to the reader as to what is important here: the future of a citizen-created world that includes new types of money, drug development and testing, criminal investigation, and small-scale manufacturing among other systemic changes. These issues matter in this book. In the socialstructing area, Ms. Gorbis certainly makes her case.